True customization of footwear is an application for 3D printing that has been on the near horizon for the better part of a decade. It was one of the expected growth areas for the market when the first TPU filaments became available, but a few gaps in the toolchain caused a long delay. Software packages like Fusion360 close some of these gaps, and now with the H-Series we’re closing the others. One of the main challenges of fully-customized footwear is getting the CAD data of a subject’s feet into a digital form usable for the footwear designer. Early in this project, we experimented with consumer-level handheld 3D scanners (photogrammetry). It is possible to scan the entire foot with these devices, but not in the loaded position. If the subject is standing, the most critical portion of the foot for custom shoe design (the bottom) is inaccessible to the scanner. A viable alternative we’ve found is to scan an impression of the foot made in a conformable material, like kinetic sand. But even for such a scan, commercial handheld 3D scanners are both overpriced and underperforming. So we added this need to the development list for the project. There is nothing magical about the operation of the Diabase scanner system. It uses a camera to identify where a pair of laser lines fall on the object. Since the laser sources have a known angle of incidence, the X-deflection of the laser lines when viewed from above is directly proportional to the Z-value of the scanned surface. The system knows the mechanical configuration quite accurately, so it can use the lasers to generate depth information across a series of scans, thus creating a point cloud of the entire object. It is a simple, elegant system that gives clean and watertight surfaces for smooth low-angle contours (like footprints). This is not technology that we invented – we just applied it well to the problem at hand. We started with a precision machined housing to hold the laser units at the appropriate angle. The housing also provides easy attachment and removal with hard points on the H-Series motion system. We then added an easy-to-use interface on the machine controller to run scans and retrieve scan files. We standardized the bed to minimize setup time and added a calibration cycle to ensure accurate scans. The real innovation is in how we process the scan files. The scanner-generated point clouds (.PLY files) are clean and accurate, and if you open them you will see the clear resemblance to the object that was scanned. But working with those file types is unpleasant. Using existing software (like Meshlab) to surface those points works well, and allows you to export an STL file, but STL files are still pretty much unusable in CAD software. Our post-processor takes the scanned files and converts them directly to a format recognized by Fusion360 as T-splines. This surface format can then be easily used with design tools (to start or terminate an extrusion, trim or split a body or surface, etc.). This type of surface can also be easily modified in the “sculpt” workspace. Say you want to raise the arch, or adjust the toe spacing. These types of orthotic modifications can be made easily with the T-spline surface. 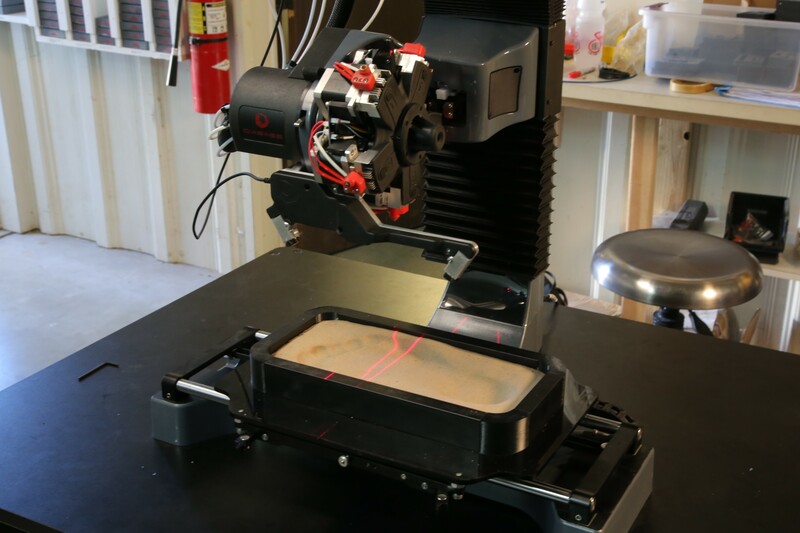 The scanner can also be used radially for more traditional part-scanning. We use this feature to scan imprints of our hands for custom bike grips. But you can also scan any part that you can mount to the H-series rotary axis.